If you’d like something a little more minimalist, this simple arm tattoo would do just fine. 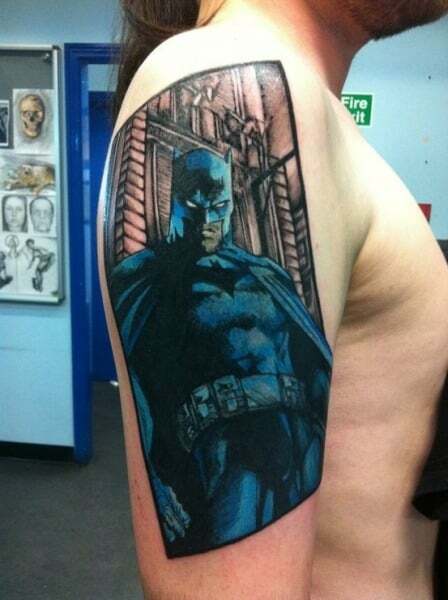 Done in black ink, you can see the face of the superhero peaking out from above his cape. The bat-winged cape underneath states ‘BATMAN’, thereby representing your devotion to the masked man. This intricate leg tattoo is utterly stunning. Done in shades of black, gray, and white, it brings the comic book to life. Here you can see the superhero as he is called for help. The bat-signal shows the danger that looms ahead. Moreover, the backdrop of buildings ensures that the Dark Knight stands out. A collage of all things batman, here you see the hero in his classic costume with the Bat signal illuminating the background. Done predominantly in dark ink, it forms a brilliant contrast against the bare skin. Consequently, this detailed leg tattoo is sure to make anyone do a double take. 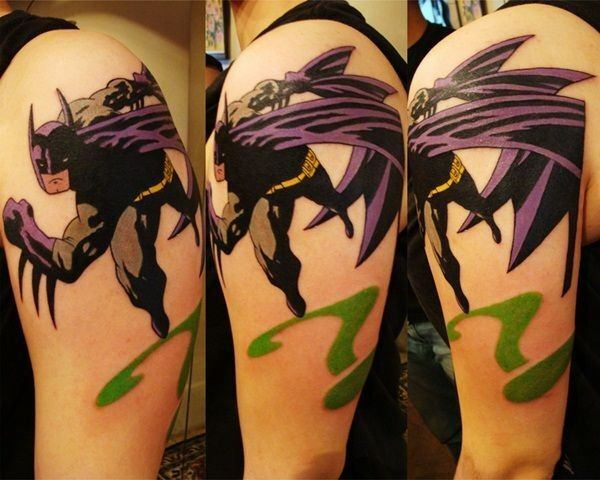 Embody the spirit of the comic books with this awesome shoulder tattoo. Here you can see Batman running along to save the day. Done predominantly in darker shades of purple, black, and gray, it forms a wonderful contrast with the yellow of the belt and the green of the ground. Here, Batman is represented with the silhouette of his head emerging from a choppy outline of the bat. 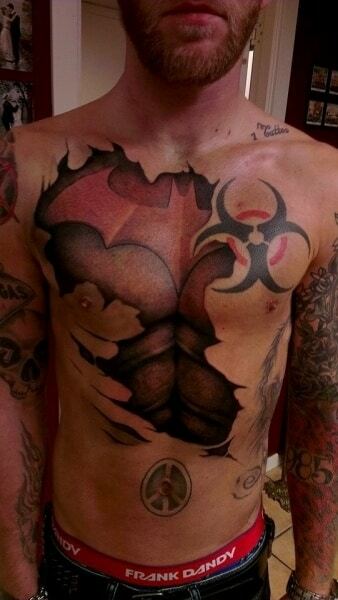 This tattoo shows how he isn’t the traditional good guy, but rather a character immersed in shades of gray. The bat symbol also gives rise to multiple bats on one end, and the Joker on the other. 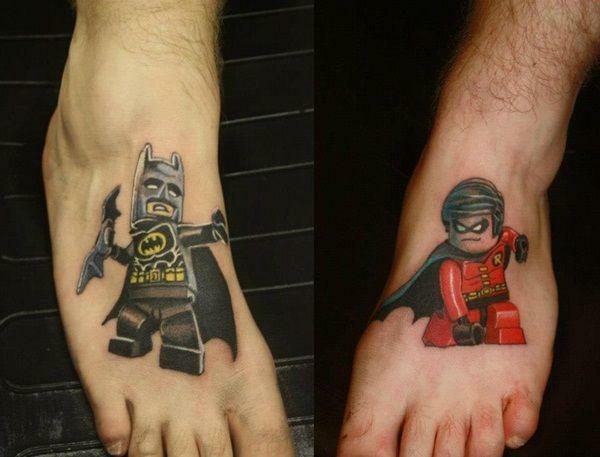 One of the coolest tattoo ideas, this hand tattoo combines two popular loves – that of Batman and Lego. Here you can see the Dark Knight on one hand, and Robin on the other. The former is done in predominantly black shades with a few touches of yellow, while the latter is predominantly inked in red. 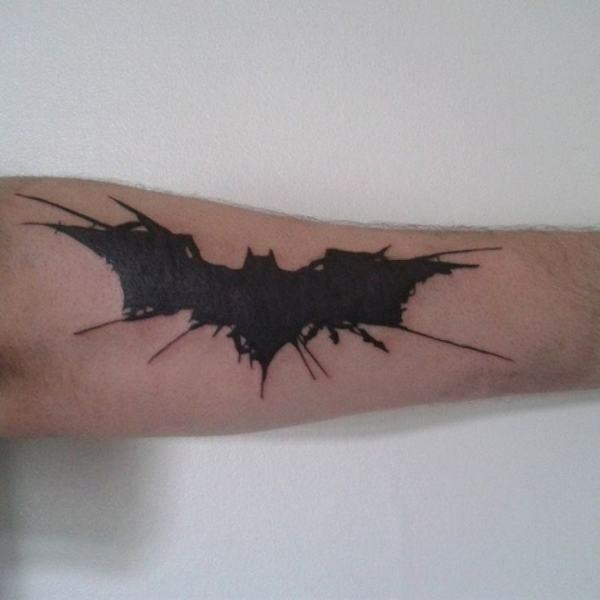 This awesome batman tattoo depicts the silhouette of the superhero by inking the shadows on his face. The black depicts the night – the time when his vigil begins. 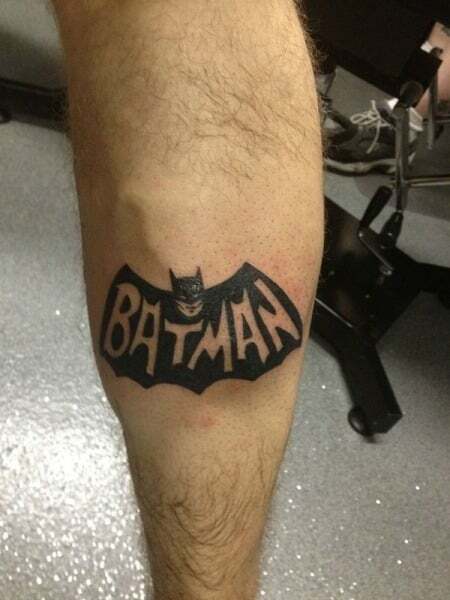 At the bottom is the well-known Batman logo, giving more character to the entire design. Who wouldn’t want to be Batman? 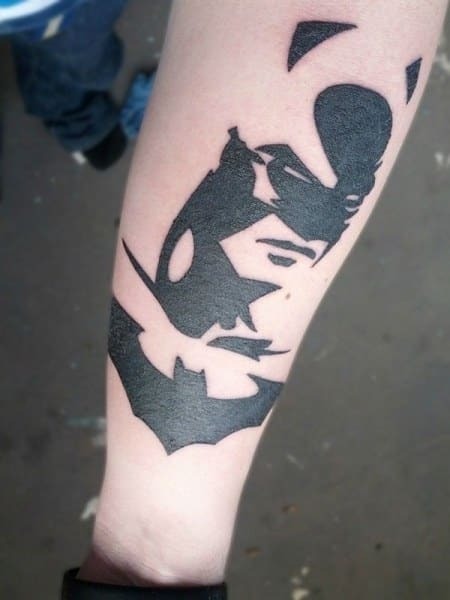 Created with the fantastic contrast of black and red, this is one of the best Batman tattoos out there. It appears as though the skin is torn away to reveal the armor which has the incredible logo etched in the center. 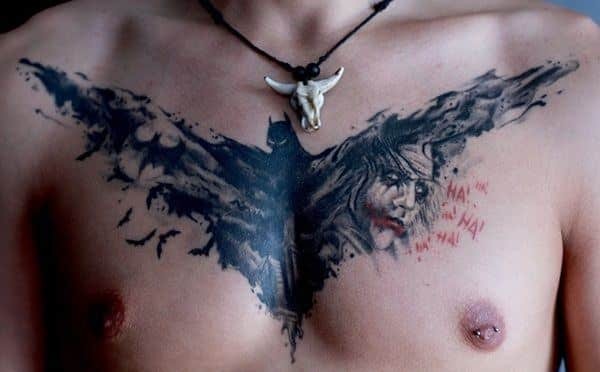 This is a fantastic Batman tattoo for men. It adds a unique touch to the classic Batman logo as it shows slashes arising from the usual design. This represents the gory and dangerous nature of the character itself, as he sets about the task of keeping Gotham safe. 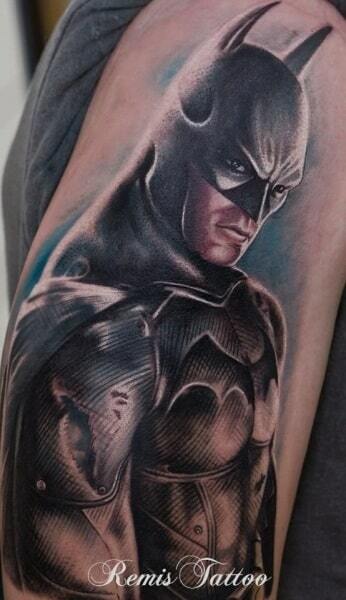 One of the best Batman tattoos for guys, this is perfect if you are a die-hard fan of the comic books. 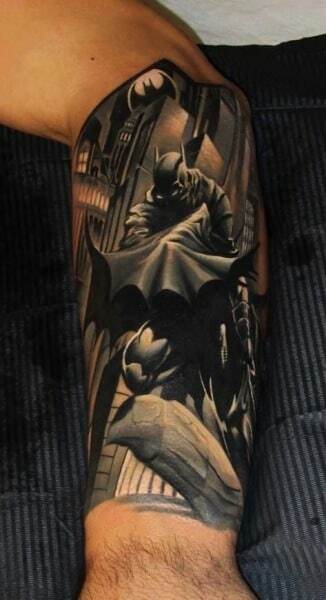 The arm tattoo depicts a scene with Batman at the very front and the entire of Gotham in the background. Here, the superhero is shaded in tones of blue and black, while the city in the background appears sketched on in quick black lines. This arm tattoo brings the incredible hero to life with detailed shading. Here you can see Batman glowering in his traditional black costume with a light blue background to provide further contrast. 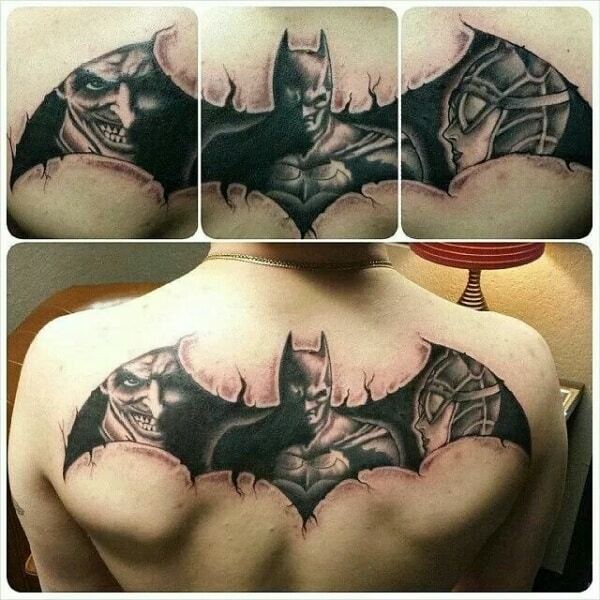 This amazing tattoo depicts the batman logo with the superhero occupying the central position. Done entirely in black ink, it has been shaded for optimum depth. The wings of the logo are each occupied by two of his most notorious foes, thereby representing the eternal power struggle.